Gemini 8 was in trouble. The spacecraft was spinning rapidly, the astronauts were fighting to stay conscious, and worst of all — they were out of the reach of NASA’s Mission Control. The astronauts eventually did make contact during that 1966 mission, and splashed down safely. Still, the incident illustrated a weakness of having scattered ground stations staying in touch with orbiting spacecraft. NASA had a large network of stations, including ships and remote satellite dishes, but there were large gaps in coverage. Today, NASA and Roscosmos (the Russian space agency) have virtually 100% communications contact with orbiting astronauts and cosmonauts in the International Space Station, including video. That’s due to a network of satellites called the Tracking and Data Relay Satellite system. The first of these satellites launched 30 years ago today (April 5) in 1983. TDRS includes seven operational satellites that are in geosynchronous orbit (essentially, in an orbit that keeps them above a fixed location on Earth.) The satellites are designed to serve spacecraft that are orbiting in low Earth orbit, above 45 miles (73 kilometers) in altitude. They’re spaced out to make sure that customers receive coverage throughout the orbit. Operations on the ground consist of two ground terminals located near Las Cruces, New Mexico. Launching these satellites took years. Although the first satellite was deployed successfully, the second one was destroyed in the Challenger shuttle explosion of 1986. The rest of the first generation of TDRS satellites went into space between 1988 and 1995. Three more advanced satellites then launched between 2000 and 2002. This means the TDRS fleet is getting pretty old, but luckily, there are fresh replacements on the way. TDRS-K launched in January and is still being tested before assuming operational status. TDRS-L will launch in 2014, and TDRS-M in 2015. NASA’s Tracking and Data Relay Satellite System will get an upgrade as the first of a new generation of communications satellites was launched to orbit on Wednesday, January 30 at 8:48 p.m. EST from Cape Canaveral. See the launch video and more images of the launch, below. The TDRS system provides a critical communications link to Earth for the International Space Station, the Hubble Space Telescope and many satellites. The TDRS system provides tracking, telemetry, command and high-bandwidth data return services for numerous science and human exploration missions orbiting Earth. These include the International Space Station and NASA’s Hubble Space Telescope. TDRS-K was launched on a United Launch Alliance Atlas V rocket from Space Launch Complex-41. After a three-month test phase, NASA will accept the spacecraft for additional evaluation before putting the satellite into service. The TDRS-K spacecraft includes several modifications from older satellites in the TDRS system, including redesigned telecommunications payload electronics and a high-performance solar panel designed for more spacecraft power to meet growing S-band requirements. Another significant design change, the return to ground-based processing of data, will allow the system to service more customers with evolving communication requirements. 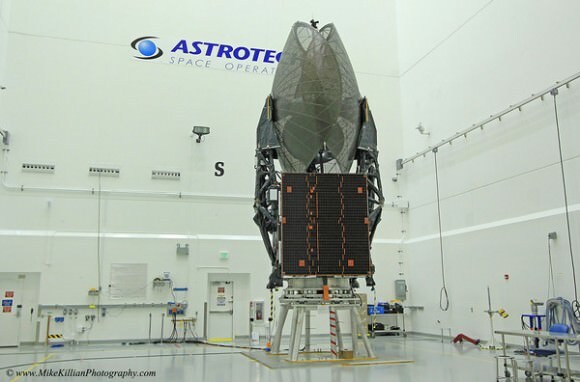 The next TDRS spacecraft, TDRS-L, is scheduled for launch in 2014. TDRS-M’s manufacturing process will be completed in 2015. The Atlas rocket clears the utility tower. Credit: John O'Connor/nasatech. he vehicle begins to gain speed as she burns off fuel. Credit: John O'Connor/nasatech. The TDRS-K launch at the beginning of the roll program. Credit: John O'Connor/nasatech. See more images and details of the launch at the nasatech website.